Cook-tops are usually installed with drawers underneath, or in some instances, a separate wall oven. If you are placing the cook-top in an island, take time to think about how you will vent it. These are available as 24″, 30″, 36″ or 48″ in either drop-in or professional style with face mount dials. Think about the look you want and the style that works best for how you cook. 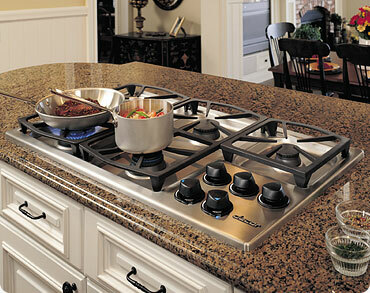 Some of these cooktops are also available with intergral downdraft venilation and BBQ grills, wok rings etc. These are usually drop-in cook-tops, 24″, 30″, or 36″. Some models are available with integral downdraft. These are the new kid on the block. Induction cooking is promoted as offering the speed of Gas cooking, while being safer and more efficient. See the video below!